The healthcare industry is one of the top employers in our state. The industry offers good paying jobs and needed services that help keep communities healthy. Edgecombe Community College (ECC) now is one of two North Carolina community colleges that offer a simulated hospital environment on campus, producing ready-to-work graduates with more hands-on experience. Students at ECC’s Biotechnology and Medical Simulation Center have the opportunity to learn in a high-tech simulated hospital environment before they begin clinical rotations and work with live patients. ECC opened the state-of-the-art 45,000-square-foot Biotechnology and Medical Simulation Center on its Rocky Mount campus in January 2016 and currently has over 300 students enrolled in its certificate, diploma and degree programs there. The Biotechnology and Medical Simulation Center has multiple classrooms and a 96-seat auditorium. The simulated hospital is spread over two floors and has an emergency room, intensive care unit, nurses’ station, radiography suites, surgical suite, and an ambulance setting. ECC provides training using the equipment for the following programs: Nursing, Practical Nursing, Nurse Aide, Medical Assisting, Surgical Technology, Radiography, and Respiratory Therapy. Taylor Hart, August 2016 ECC Surgical Technology graduate, was impressed with the new building and technology. 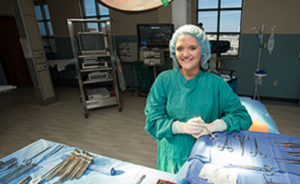 Taylor Hart Edgecombe Community College Surgical Technology graduate now works at the SurgiCenter in Greenville. In January 2016, Hart’s classes transferred over to the Biotechnology and Medical Simulation Center on the Rocky Mount campus. Hart completed allied health sciences courses at Tarboro High School before earning a bachelor’s degree in recreational therapy at East Carolina University. After finding a limited number of job openings in her field, she enrolled at ECC to add the surgical technology certification to her skill set and expand her options for health care employment. Hart is now working at the SurgiCenter in Greenville. Edgecombe County and the Golden LEAF Foundation provided funding for construction, and the college provided funding for equipment and technology. 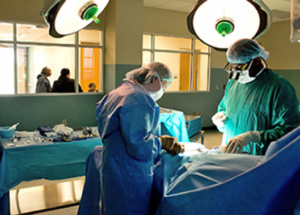 For more information on the Biotechnology and Medical Simulation Center, visit http://www.edgecombe.edu/.